So now that Pres. George W. Bush has stopped hating on Conway West after the “disgusting moment” comment, a new target for Kanye West‘s frustration became Today show anchor Matt Lauer. 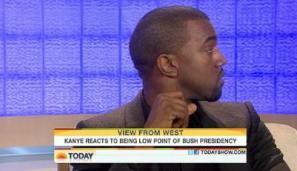 Today Lauer played more of the tape, and issued a challenge to Kanye to continue this epic battle a few weeks from now. I mean pre-looking at his face, I came up here because I wanted to say something to him right after the fact. You know what I’m saying, you don’t have to do the TV stuff with me. This is reality. This is the real thing going on. You know what I’m saying, I don’t need all the jazz. I would say to…could we be quiet for a second? Then he said the quote that played yesterday, although immediately after Lauer tried to prompt him with “…and you’re sorry.” And West didn’t like the words being put in his mouth. West: Yo, how am I supposed to talk if you’re going to run this thing in the middle of when I’m talking? Lauer: It’s under. You won’t be hearing it. West: But I’m hearing it when I’m trying to talk! Lauer: Ok can you take the sound out of the overheads please? Just pick up, you said it wasn’t a race thing. West: Please don’t let that happen again. Ridiculous. Thinking back on it this morning, Matt Lauer was ready to THROW DOWN. “There’s nothing improper about it, there’s nothing unusual about it,” he said, issuing a challenge for West to show up and say those tweets to his mf-ing FACE on November 26 (when Kanye’s booked to perform on the Today show).